With its magnesium-alloy case and anodized-aluminum display enclosure, the 5102 is an extremely solid netbook. QUALITY AND EFFECTIVE-NESS: The 5102 is one of the bestmade netbooks on the market; it never once felt cheap or flimsy during the review (though the brushed aluminum display enclosure and the touch screen are absolute fingerprint magnets). The 95 percent full-size, spillresistant keyboard is simply the best I’ve ever used on a netbook. The 10.1-inch (1,024 x 600), LED-backlit multitouch screen provides good image quality, but the multitouch aspect was not as useful as I had anticipated. Increasing the space between icons would be a big step toward making it more useful during standard navigation. EASE OF USE: Because of a welcome change in the design of the mouse from previous HP netbooks and the incredible keyboard, the 5102 is a pleasure to use. Typing long passages and navigating through a multitude of applications and Web sites was both easy and efficient, and I seldom felt that a larger laptop was needed to complete a task. 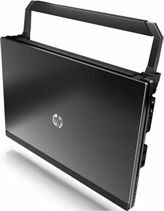 HP also included in the 5102 several intriguing tools, such as its QuickWeb feature, which initiates a 20-second booting up into a Linuxbased operating system that offers access to a Web browser. CREATIVE USE OF TECHNOLOGY: The 5102’s sturdiness, available Webcam, keyboard design, long-lasting battery, optional handle, QuickWeb, and ability to play high-definition video make it a standout in the netbook market. These options certainly come at a cost, as a unit with all the features mentioned above would cost $600 to $700. This begins to approach the cost of a full-featured laptop. SUITABILITY FOR USE IN A SCHOOL ENVIRONMENT: The unit is unquestionably well built, and its design will allow it to take the abuse prevalent in an educational environment. The price, however, may prove prohibitive to districts looking to enter the netbook market because of the units’ lower cost. The 5102 is one of the best-made, highest-performing netbooks available. Using the unit is enjoyable, and when performing most productivity tasks and surfing the Web, it’s easy to forget that one is using a lower-powered netbook. The touch screen is optional, and at this point I’d recommend simply going with the standard screen, as the new mouse pad works well in navigating and operating the unit. The nine-hour battery life is just outstanding. The only drawback of the 5102 is the price.